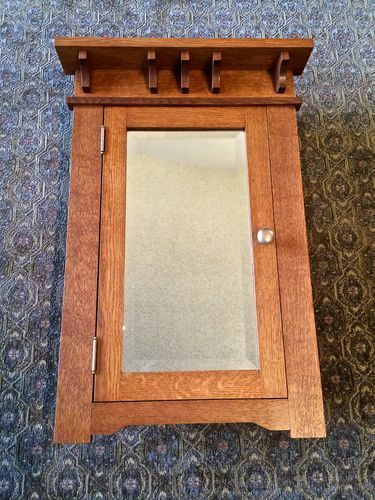 Mission and Arts & Crafts style Medicine cabinet made from quarter sawn white oak, with beveled mirror. This is a very nice medicine cabinet. Congratulations. James, that is very tasty. I wish I needed a medicine cabinet. Very nice. I really want to make something like this. Good job, James. You captured the Mission Style quite well. Kudos! Not only did I have to edit my title. I had to edit the spelling in my discription. A very nice looking A&C medicine cabinet—a fine addition to your bathroom!